Having finally healed from sitting through A Talking Cat!?! (2013), I decided to delve back into the DeCoteauverse with a triple helping of talking (or at least loudly thinking) animals. None of them quite achieves the cosmic dread of A Talking Cat!?! but they come damn close. A Magic Puppy (which is how it is listed on Netflix for anyone foolish enough to watch it), is probably the most interesting of the three; although none of these films is exactly a hotbed of excitement. The story features Kristine DeBell as the single mother of Adam (Evan Crooks), who is obsessed with horror and Halloween. Adam ‘s girlfriend, Molly (Stephanie Shemanski) brings over a copy of the Necronomicon (pronounced ne-chrome-eh-con for some reason) and they end up turning mom’s boyfriend (Eric Roberts) into a full grown adult bulldog that is most certainly not a puppy. 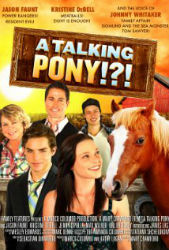 A Pony Tale (unless you believe the closing credits title, then its A Talking Pony!?! ), brings us DeBell again as a single mom with her kids including stepdaughter, Juliet (Jenny Cipolla), who live on a ranch that seems to consist of a single horse that is no way a pony. After Juliet suffers a concussion from a falling horseshoe, she can hear the horse pony speak to her. The family is in danger of losing the ranch to a rich but lonely developer, and then we get to watch the pony offer no help for eighty minutes. 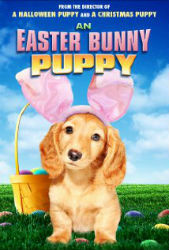 An Easter Bunny Puppy features DeBell (in an obvious wig this time so it's a totally new experience) as Jennifer, a mystery writer tasked with writing a children's book about Easter. Her daughter (Alison Sieke) in trying to avoid embarrassment in front of some local boys claims she has a twin sister. There's also a mystery involving a wrongly jailed dad and a missing gold egg, and it's all narrated by a dog that looks nothing like one on the cover. I decided to review these movies together because essentially they are all the same film. They offer the same basic plot of broken families somehow being brought together through the magic of a talking animal, except in this case the pony never actually does anything, and no one can hear either puppy. All three films feature the exact same locations, props, and Kristine DeBell playing virtually identical characters. There are huge stretches of time wasted on stock footage, egg dying, and driving montages that go nowhere. 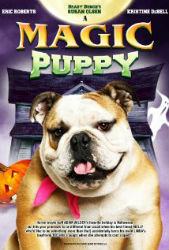 A Magic Puppy at least throws in a cameo by Cindy Brady herself, Susan Olsen, as a neighborhood witch. Some reviewers are less than kind to the actors, but the fact than any one of them can create an even semi-coherent performance from some of the weakest scripts imaginable is actually impressive. These films are so lazily paced and constructed that they bore you into submission before blindsiding you with the occasional bizarre moment. It's these strange turns that recapture some of the magic of A Talking Cat?! ?, and (barely) elevate them from cheap crap to weird train wreck. Some highlights include: Eric Roberts jamming his fingers into jelly donuts, Juliet’s obsessive compulsive brushing of her horse and the Easter Bunny Puppy telling you straight up that most of the movie you're watching is a sham and has no connection to the plot. A Magic Puppy, A Talking Pony!? !, or An Easter Bunny Puppy, have nothing of value to any normal human, but at the same time I wouldn’t discourage anyone from watching them. It’s certainly something you won’t soon forget... assuming you can stay awake.